The BMWCCA National Board met in Los Angeles recently. I am not on the National Board (personal club aspirations possibly? ), but an open invite went out to all members of the BMWCCA. Being a long-term member with a great BMW story, I jumped at the chance to meet everyone. Also, I am the webmaster for the LA Chapter’s website and I want to be more involved with the Club. A large portion of the new involvement will involve a full revamp of the LA Chapter website. Soon it will have the look and feel of the National BMWCCA website. This will add more continuity to the Club digital properties. 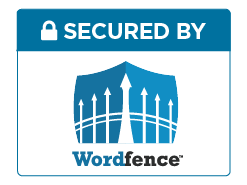 In addition, it will make the regular updating and maintenance of the website much easier. All good things for my chapter of the BMWCCA. A smaller portion of my involvement is attending more events that are not necessarily driving events. Don’t get me wrong however, I want to attend more of those also. Events where Board members and leaders in the Chapters are events that I’m looking to attend. I feel confident that there will be lots of overlap and I’ll be able to meet-n-greet the movers-n-shakers of the Club. My first opportunity to meet and mingle with decision makers within the BMWCCA came shortly into the new year. The Club’s National Board met in Los Angeles and all Club members were invited to a meet-n-greet dinner after the day’s meetings. It was a delightful time where I got to see and speak with LA Chapter President Kurt Helm and also see “Always Active Member” Delight Lucas. A definite highlight for me was meeting a person that I hold in very high regard in the BMW world. He has entertained and wowed with his magnificent work as Editor-in-chief of Roundel magazine. I was honored to get the autograph of Satch Carlson on a piece of cool BMW swag. You can see from my extreme grin that I am elated! So, this year is going to be active for me and the BMWCCA. The LA Chapter website is getting a facelift under my care. Also looking forward to attending many more BMW events, like O’fest and Thermal club outings. If you are a part of the BMWCCA I’d love to meet ya and have a chat about BMdubyahs. I highly encourage anyone that has the Bimmer bug to go by and look at the BMWCCA website. Learn more about what we do, why we are so passionate, and then join up! BMWCCA Foundation is Always Amazeballs! Living on the West coast of the US makes visiting the BMW Car Club of America’s Foundation museum a bit more of a trek. I used to live just a short drive from the front doors of the always amazeballs place, but now the drive is a bit further. This is why visiting the magnificence of the BMWCCA Foundation Museum is that much more awesome for me! This year I made it home for the holidays. The first place I visited was not family, much to their chagrin. The place I drove straight to was the BMWCCA Foundation museum building where Michael, the longtime curator and driving innovator at the museum, was waiting to let me in. He and I have known each other for many years now and it is always a pleasure catching up with him. Michael is a wealth of BMW knowledge and has deep ties with the BMWCCA. Getting “the tour” of the museum facilities from him is a privilege and time I highly value. I highly encourage any BMW fan to research and then make an appointment to go by and experience the BMWCCA Foundation for yourself. The building is located adjacent to the BMW Performance Center near Spartanburg, SC and just on the outskirts of North American BMW mecca. Like any Bimmer aficionado needs an excuse to take a drive around the birthplace of many a BMW. The extensive collection of cars at the Foundation museum over the holidays was in preparation for the “Heroes of Bavaria: 75 Years of BMW Motorsport” exhibit. Featured were many past BMW cars from varied racing genre ranging from IMSA to Formula series. I took lots of pictures and share two of the prime ones below. One of my all time favorite #BMW liveries. The color black is a better wrap IMO but this little monster will scream! Connect with me on Instagram (havarino) for all my latest car pics. I focus mainly on BMW (of course) but I don’t discriminate against automotive awesomeness. So… there might be some other car manufacturers shown, but they will be great eye candy. I am a motorsport enthusiast through and through. My passions include seeing the latest automobile tech going fast. My background is in Internet technology. Admiring cars, along with following motorsports, drives my desire to experience more car greatness. Race action highlights included Lewis Hamilton winning the race with Sebastian Vettel in a close second. Some great on-track action was given to fans with the Mercedes and the Ferrari battling it out at the start and then later during pit stop rotations. During the closing few corners of the grand prix, Max Verstappen was able to maneuver past Kimi Raikkonen to take third place. However, Verstappen exceeded track limits and was immediately given a 5 second time penalty that relegated him to 4th. Overall an exciting race to watch and not the sometimes snoozefest of other F1 races. 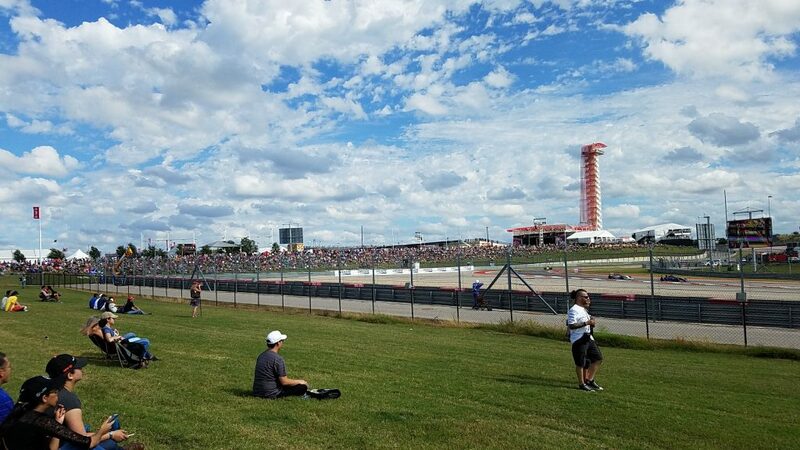 The United States Grand Prix brings excitement to fans, both on track and after the racing is done for the day. 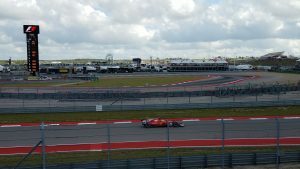 Several support races in 2017 at Circuit of the Americas (COTA) on the F1 weekend. There was FIA Formula 4, a feeder series for open wheel racing, and the Masters Historic Racing, which is comprised of classic Formula 1 race cars from the years of 1966 to 1985. Two wonderful open-wheel series that provide huge levels of car eye candy and racing action. But, the fun and entertainment were not just on the track! The USGP race weekend had big entertainment names on the roster. First, Justin Timberlake performed Saturday night after the F1 qualifying session. The concert was relatively brief, but JT didn’t underwhelm. Then on Sunday night following the GP, Stevie Wonder performed and entertained as he always does so well. As an added bonus at the track COTA erected a Fan Zone with a Ferris wheel and activities for the whole family. But, what appealed to me as a huge fan was the easy access to food and beverages along with little wait times for the bathroom. COTA does a good job of making sure the race fan has a good experience. Not everything is always smooth like butter, but I sincerely feel this track listens to fans and makes changes quickly to improve the fan experience. 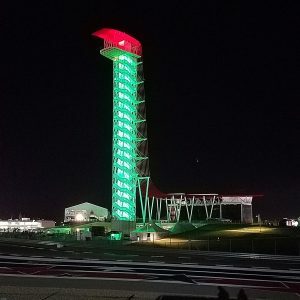 I realized the true willingness to improve the fan experience by Circuit of the Americas when traveling to other Formula 1 races and other racing events in general. One big aspect that stood out to me at COTA is the ability to circumvent the entire track. As a fan, one can walk around the entire perimeter of the track with little areas off limits. This was quite the contrast to the F1 race at the Autódromo Hermanos Rodríguez in Mexico City. I attended last year and was limited to a small area of the track inside the baseball complex. The food and beverage options were extremely limited and the entertainment off-track was nill. The two track experiences were night and day contrast. This is why I will recommend a COTA visit over another track. One thing that was missing for me was the absence of the downtown Austin Fan Zone Experience. It seemed like there was an attempt to be replicated on site at COTA with the Fan Zone and the two big name concerts, but it fell short in my opinion. Having F1 and all the circus and circumstance around it in the heart of Austin made me feel welcome as a race fan. 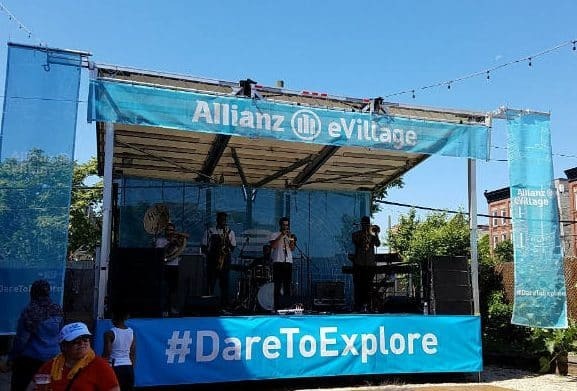 To me having the downtown entertainment brought the entire race weekend from the track into the heart of the city. This only improved the experience for me as a fan. My hopes are that the City of Austin, Circuit of the Americas, and Liberty Media can come to a huge compromise and throw the ultimate Formula weekend party that encompasses COTA and downtown Austin. This weekend in Austin saw Mercedes take the 2017 Manufacturers Championship, but left the Drivers Championship still alive. It will be difficult for Ferrari’s Vettel to make up the points deficit to beat Hamilton, but that’s why we are race fans and watch the events. COTA’s Fan Experience was fantastic and I hope that downtown Austin can be more assimilated into the F1 weekend festivities in the future. Having Austin in the middle of the F1 mix made it a “bigger” event to me. However, all-in-all, the USGP weekend did not disappoint in the least. 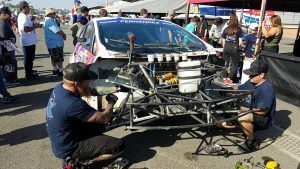 The Red Bull GRC Series made the final stop of the 2017 season in the Port of Los Angeles. It wrapped up another spectacular season of rallycross racing. As a recognized motorsports Super Fan, I couldn’t miss the opportunity to witness 600HP rockets fly around a dirt track and take jumps like racehorses. It was my third year attending and the GRC series never disappoints when making a stop in the Port of LA! 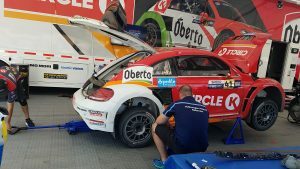 As an up-n-coming motorsport fan journalist, I really appreciate the openness and ease of media relations that the Red Bull GRC Series enables. The entire staff are extremely helpful and honestly made me feel like they wanted me, as a journalist, to have an excellent experience. I feel this is also directly translated to the overall event and is extended to all GRC fans. Red Bull has once again conquered the event experience and provided a rich time for fans. I thoroughly enjoy telling the story of a motorsports event from the fan perspective. Fans are what drive sports! (Pun intended). Showing and telling the fan story, as I experience it, hopefully, can show how motorsport events are a really good time. And, possibly encourage others to follow alternative racing events like Red Bul GRC Series, Formula E, and soon, Roborace. Traditionally, the higher up the pay scale of the race series the more disconnected the drivers, team personnel, and overall series staff got from the fans. It gets close to the point (like in Formula 1) where the fans almost appear to be an inconvenience to the race event itself. Now, thanks in part to NASCAR’s success with fan interactions, other series are getting back to what actually makes them exist in the first place. Fans are basically why racing exists and continues, so it is quite invigorating to see other top-tier series embrace fans too. This is a great panoramic shot of the entire track. It is the view that almost all the fans had to watch the on track action! 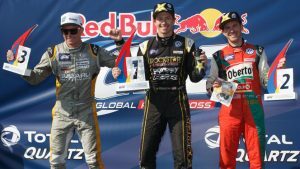 The entire Red Bull GRC series race season was dominated by the Andretti VW duo of Scott Speed and Tanner Foust. So it was no surprise that they ended the season on top of the podium. Foust took the Port of LA race win to finally get a race win in Los Angeles. And, Speed took his 3rd consecutive GRC Supercars championship. 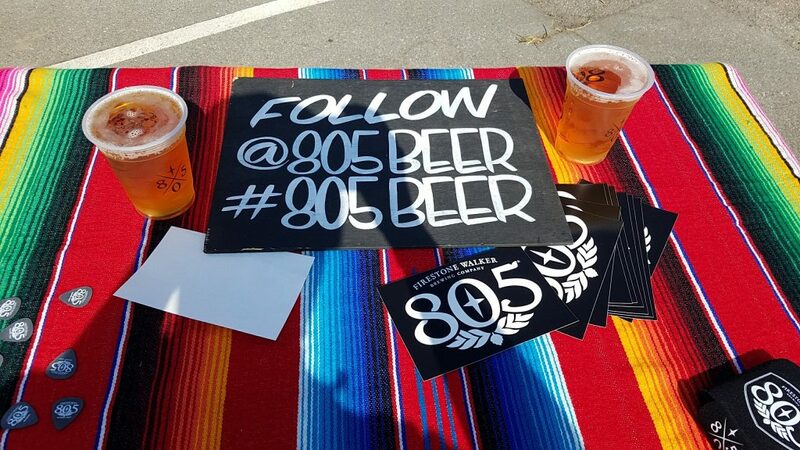 A great perk from the fan perspective was seeing 805 being served as the beer choice. Firestone Walker, a mid-California based craft brewery, was the sole beer provider. They came prepared with lots of attractive staff, 2 well tapped serving stations, and lots of swag to give out. I thought it was fantastic to have one of my favorite beers served and they are basically a local brew. This was good planning by Red Bull events to tie in a higher end beer choice with a local flare. My kudos to the team that decided to make that choice. The fan experience is only improved when access is granted to the paddock and pits area. 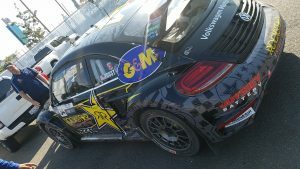 Red Bull GRC Series has a very open pit and trailer area where lots of great inside shots can be taken of the 600 HP mini-beasts that scream around the course. I was fortunate enough to get a little behind the scenes and see some of the cars in their most stripped down, “DAMN! We gotta fix this thing!” condition Saturday after the Super Cars final. 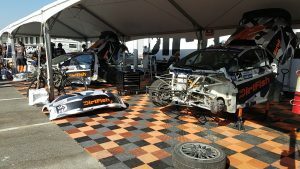 Red Bull GRC Series only improves from the fan perspective year over year. The cars are fast, the racing is dicey and exciting, and the Series gets what needs to be done for success. I encourage everyone who likes motorsports to check out this action-packed, “rocket” filled series. It starts all over again next year in April so put it on the racing calendar and tune in! The Super Fan concept was introduced at the Berlin ePrix at Tempelhof in 2017. The lucky first pick was James Harmon, a 22-year-old Welsh gentleman who is very keen on motorsports. He is a passionate racing fan and was thrilled by the opportunity Formula E granted him in Berlin with being the first SuperFan. Watch the video and see the emotion in his face and hear it in his voice. James is a true Formula E Super Fan and a fine lead-off example of what FE fandom can produce. I watched the video for the first time shortly after the Berlin race and felt overjoyed for the guy. My past experiences with everyone involved with Formula E were so positive so I was happy to see others enjoying the positive vibe that FE embodies. Appreciating the fan and going that extra step to ensure their good time is one of the big things that drew me to Formula E. It’s been a key selling point of the series since I first encountered FE at Long Beach in season 1. 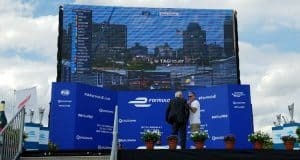 When Formula E announced the season 3 schedule, I admittedly was very disappointed that Long Beach was axed from the calendar. However, I am an FE fan due to their great efforts in season 1 and 2, so the choice to trek to New York was almost a no-brainer. Hotel got booked, flights locked in, friends notified of arrival in NYC area, and off I went to see the brand new course on the streets of New York City. The track was amazing! The Formula E area was nestled in the Brooklyn Cruise Terminal in Redhook. The track wound around the terminal area and encompassed some of the local street areas. 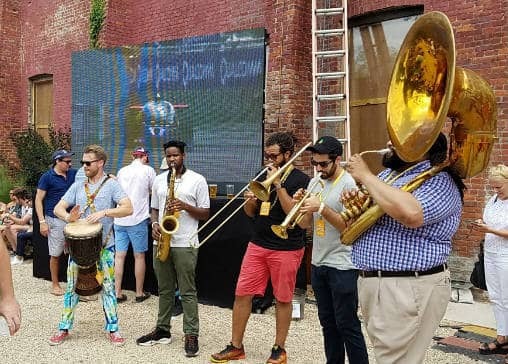 One of the best areas was the beer garden area where live music played and good beers flowed. Overall, I missed my Long Beach track, but the NYC area as a whole was very inviting and made for a great race location in my opinion. The high point of the NYCePrix was the total surprise of being chosen as the second Formula E Super Fan. To say I was elated and brought to tears is an understatement. I completely agree with James Hardon when he says in the video that “This is the greatest day of my life.” There’s more to my NYCePrix Super Fan story if you want to read about it and see some great photos. Plus, I met Sir Richard Branson and got it all on video. waiting for the Formula E drivers and Sir Richard to come up. He was pleased to hear that I traveled all the way from Long Beach, California to be a part of the New York weekend. I told him that the Super Fan experience was a highlight of my life and an initiative that needed to continue. Now Formula E has 2 Super Fans! Both fully agree that the experience is the best thing that has happened in their motorsport-fan lives. This is a great effort that Formula E can continue. FE can grow their fan base with this effort and truly reward the fans that wholeheartedly support everything that Formula E is showcasing to the world. The Super Fan effort can be even greater when teams like Mahindra and Techeetah reinforce the fan experience with campaigns like #Passioneers and fan contests during the season. Reinforcing all those efforts is what DHL Americas does on Friday prior to the race day/weekend. This is when a lot of the press and PR relations happen. Motorsports journalists and other racing outlet reps are invited in to hear how DHL moves Formula E around the globe. Then directly following, everyone is toured through the FE pitlane. The whole Friday experience really reinforces the die-hard racing enthusiast’s passion for Formula E and helps fans get a deeper understanding of the series. Being lucky enough to be chosen as Formula E Super Fan is amazing. This is a program that has brought immense joy into two people’s lives leaving them with moments in time they will never forget. The type of moments that will be treasured for a lifetime and talked about for ages. Formula E needs to continue this program of rewarding true FE fans with a lifetime experience. And, work with the teams and logistics partners to make the Super Fan the ultimate fan experience for any racing series.